DVD Synopsis: Edgar Allen Poe's classic of paranoic and suspense, The Fall of the House of Usher, has been filmed many times over the years--none as highly acclaimed as this 1928 masterpiece by one of France's leading avant-garde visionaries, Jean Epstein. 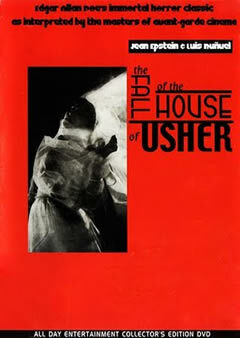 The last of Epstein's collaborations with Luis Bunuel (Discreet Charm of the Bourgeoisie) and the only one of Epstein's works to receive theatrical distribution in the US, The Fall of the House of Usher is pure Gothic eye-candy and must-see viewing for all aficionados of fantastic film. In the hands of director Jean Epstien, The Fall of the House of Usher is as much a celebration of the art of film making as it was a cinematic telling of Edgar Allen Poe’s famous short story. The film abounds with special effects, from the use of superimposed images (like when Madeline’s casket is being carried to the crypt), to slow motion shots of curtains blowing in the wind. At one point, the camera actually seems to ‘break free’, flying through the hallways of the house as if carried by the wind. It is rare, especially in the silent era, to see an artistic approach such as this blend so well with engaging storytelling.